Yvonne an enthusiastic educator who is a great motivator and has a willingness to take on-board any advice and guidance. Yvonne likes to take the tamariki out into the community and on bush walks in the Tuatapere domain, along with other Educators to help the tamariki connect with nature and mix with a larger group. These walks to the community and into the Domain support learning across all domains. Yvonne provides a variety of resources and uses the toy library to rotate the toys and keep the Tamariki challenged and stimulated. Yvonne has a large Haerenga/outside area with plenty of space for running around and also has the large wrap around veranda which is used as a shelter from the sun or rain and can be used as an extra play space often for the tents, tamariki love enclosures and hidey spots to play in. 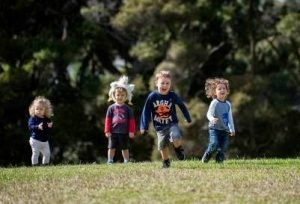 This allows for the large gross motor development in her tamariki as they get to climb, jump, run and ride on bikes to burn off excess energy. Yvonne was very proactive with beginning her tamariki profiles pukapuka (books) and has the photo’s printed and connections to Te Whāriki our Early Childhood Document. Yvonne has a current first aid certificate, clear police vetting for her home, she meets all our licensing criteria and actively participates in our ongoing professional development and training.